Copyright (c) – Be Yourself Catalogue B.V.
CD2 tracklist is in the album's booklet. IAHCD001 (P) 2019 WE R Music B.V.
(C) 2019 Be Yourself Catalogue B.V.
All rights reserved, unauthorized copying, reproduction, hiring, lending, public performance and broadcasting prohibited. It has been almost 10 years ago that Fabian Bohn a.k.a. 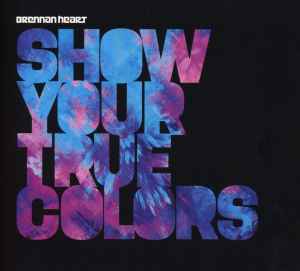 Brennan Heart released is very first studio album called Musical Impressions. This year Mr. I AM HARDSTYLE will bring you his 5th (!) studio album with the title Show Your True Colors, of which he states it is his most personal album so far. This top notch album features 12(!) new tracks such as the official I AM HARDSTYLE 2019 Anthem, Fight For Something with Coone and Max P, Need To Feel with Mattanja Joy Bradley, the Aftershock remix of Fight For Resistance (with Zatox), If You Fall, I’ll Catch You and many many more! On the album you will also find and an extra disc with a continuous mix ( CD Only) and 2 bonus tracks; the Brennan Heart & Toneshifterz remix of Blah Blah Blah (Armin van Buuren) and the Brennan Heart remix of BOOM (Tiësto, Sevenn & Gucci Mane).